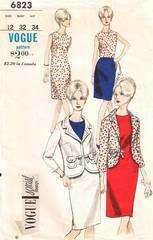 Vintage Vogue Special Design pattern. Sleeveless shift dress has front and back yokes. Hip length jacket with short belt that comes from under jacket flaps with bow at center. Slim straight skirt with waistband and back zipper. Tuck-in blouse with top-stitiching and back zipper. Size 12; Bust 32; Waist 34.